Barley Woods by Cornerstone Homes is a 124-home community in Fredericksburg, Virginia. Residents will enjoy a clubhouse and many relaxing amenities fit for gathering with friends and family for fun. Situated in a prime location for shopping and entertainment, homeowners in this 55+ active adult community will never run out of fun and exciting things to do and experience. 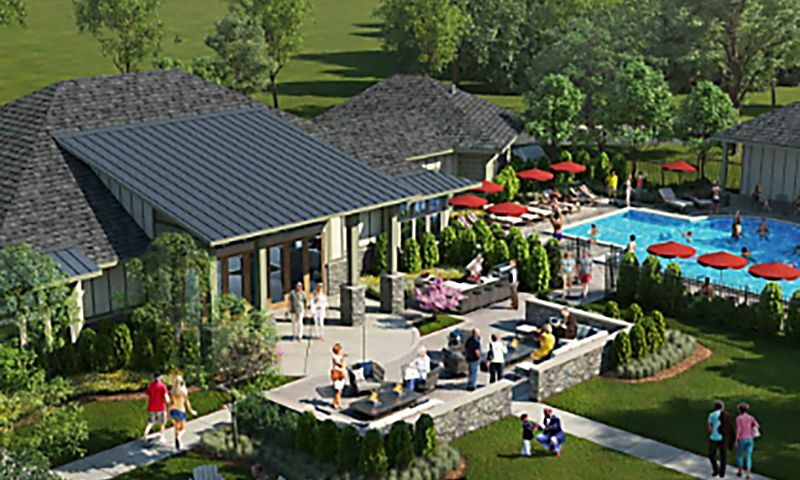 The amenities at Barley Woods will be centered around the community clubhouse. There, residents will find a fitness center for staying in shape. A gathering room with an indoor fireplace is perfect for sitting back and relaxing with friends and family. The amenities continue outdoors with an outdoor pool and patio. There are also fire pits and grilling areas for residents to gather around and enjoy. Residents can take their dogs on a walk through the walking trails in the community, to the dog park, or enjoy the fresh air at Boxwell Glade Park. Exercise trails will be available for those looking to stay in shape all around the scenic pond in the community. Cornerstone Homes began construction on Barley Woods in 2017. Upon completion, the community plans to include 124 single-family and attached homes in seven distinct floor plans. These homes range in size from 1,717 square feet up to 2,182 square feet. They include two bedrooms, two bathrooms, and attached two-car garages. These homes come with flexible indoor and outdoor living spaces, formal dining rooms, and expandable great rooms. Residents of Barley Woods will enjoy living in this maintenance-free community. Instead of spending time mowing the lawn and doing home maintenance, they’ll be free to pursue new activities and interests. A fitness center will provide many opportunities for residents to stay in shape. Swim laps in the pool or take a leisurely stroll the walking and exercising trails. Downtown Fredericksburg provides many opportunities for dining, shopping, and entertainment, and being next to interstate 95 makes getting around easy. There are three golf courses under 30 minutes away, and both a bowling alley and movie theater under ten minutes from the community. Harrison Crossing Mall is only two minutes away and provides shopping essentials like Home Depot, Great Clips, Starbucks, Petco and more. The Fredericksburg National Military Park and the Fredericksburg Area War Memorial are 15 minutes from Barley Woods. Pratt Medical Center is only a two-minute drive down the street. When traveling farther is needed, Ronald Reagan Washington National Airport is just an hour away. Whatever you love to do, Barley Woods has a place to do it in Fredericksburg, Virginia. There are plenty of activities available in Barley Woods. Here is a sample of some of the clubs, activities and classes offered here. Upon completion, the community plans to include 124 single-family and attached homes in seven distinct floor plans. These homes range in size from 1,717 square feet up to 2,182 square feet. They include two bedrooms, two bathrooms, and attached two-car garages. These homes come with flexible indoor and outdoor living spaces, formal dining rooms, and expandable great rooms. 55places.com is not affiliated with the developer(s) or homeowners association of Barley Woods. The information you submit is distributed to a 55places.com Partner Agent, who is a licensed real estate agent. The information regarding Barley Woods has not been verified or approved by the developer or homeowners association. Please verify all information prior to purchasing. 55places.com is not responsible for any errors regarding the information displayed on this website.